While traveling in Europe this spring I came across an article – ‘Roof With A View’ – in London’s Metro newspaper. 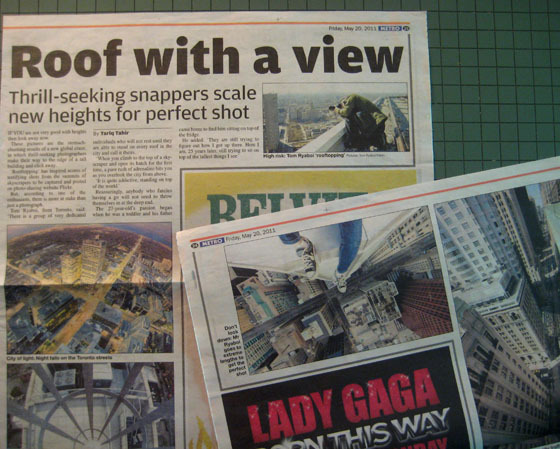 It’s about rooftopping – a world-wide craze in which photographers access tall buildings and capture spectacular images, often at great risk to themselves. One of the finest – and subject of the Metro newspaper story – is 27-year-old Tom Ryaboi, who has dedicated considerable time and energy shooting TORONTO and its people from every possible angle. This entry was posted in Art & Design and tagged Canada, Photographing Toronto, rooftopping. Bookmark the permalink.